After a console release a few weeks ago, the latest Yoko Taro and Platinum Games development has made it to Steam. 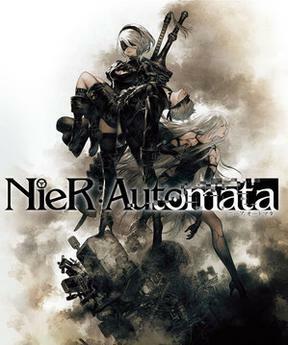 Nier: Automata, is another game in the Drakengard/Nier universe, featuring a mashup of open-world RPG, schmup, and hack-and-slash. This time, you play as 2B, the scantily clad, high-heel wearing combat android meant to kill the machines that are running amok on earth far in the future. This game went over really, really well among a subset of those interested in more weird/strange games and those with a predilection for stuff like anime, MGS, JRPGs, and Platinum. I beat the first section and boss on PS4 and am literally just waiting for a 4 hour install to finish (god console gaming these days is SO GOOD). As stated, it featured a mix of over-the-top schmup action, side-scrolling combat, and more traditional third-person combat. It plays fast and is intuitive. The soundtrack is good. Still too early to say much otherwise. The game made a pretty interesting modern day decision to forgo autosaving. I'll see how that holds up. This game has been out for awhile now, so did anyone else play it or beat it? I have it, but I still haven't finished the original Nier so I was planning to play through that first. Not enough hours in the day. I wasn't sold on this game early on, since I had a bugged quest that I had to keep reloading to finish, but since then it's been fun. Funny game, some humour, some silly Jean Paul Sartre deconstruction, debate about the nature of humanity and existence. It's no Blade Runner but it's nice to see. Combat is fun. Soundtrack is fantastic. Camera is a bit of a flaw. And now the final boss is glitched and I can't finish. Well, fun game, but the first couple hours and last 30 minutes were trash because of bugs. That seems fast. How many hours did you rack up? I'd have to check, but I'd guess maybe 10-12? It's a very contained open-world, with just a smattering of side quests and no real big huge quest hub. But it probably only takes about 5-6 minutes to run from one corner of the map to the opposite. My advice would also be to play on hard. If you can get through the first couple hours, you're golden. I'm on normal and didn't die once. The beginning is the toughest. Once I got some money and chips to improve my character, I became really hard to kill. Auto heals when low on health, health regen if no damage for 6 seconds, and part of my damage given added to my HP. I also have a shockwave effect added to my weapon and increased damage and crit chance. I'm going to try the final boss again tonight. Three stage fight, not a fan of the aerial second stage. I like how dodging and countering feels in this game. The music is still killer. Also the story ended up being pretty good, definitely dark and with some not so good things to say about religious dogma. I'm like 13 hours into the game now and I feel like I'm only about halfway maybe even less than that. I've really enjoyed it so far. I just finished the castle in the forest. Without being spoilery I'll just say you are way farther than that, and I'd highly recommend you do any and all sidequests you want to do now. I know there are multiple endings, and I currently have endings K and W.
I'm not sure how many endings there are, or how to get them all... yet. I am really loving the story so far. And the gameplay remains super fun. Definitely planning on doing a 2nd playthru. Ok, I have gotten ending A! And now I'm moving onto route B. I also decided to play on hard from now on. Not sure I'm digging the game being essentially identical in the 2nd playthrough. Starter quests and all. It was neat how they recorded your 2B settings scene and replayed it. Ok some of the new story revelations you get on the 2nd playthrough are really good. Some funny moments, and some tragic moments. I'm pretty much just steamrolling through the story and not doing sidequests on the 2nd playthrough. If fast-travel was unlocked from the get go I might have. I do worry about how many sidequests I've found, because it says I have a pretty low percentage of quests completed, but on my first playthrough I went everywhere. A lot of quests get locked once you've progressed the main story past certain points. I've got 80% of the quests completed now, and I think I'm really close to finishing route B now. I did a ton of sidequests last night and am at the forest in my 2nd playthrough. Will finish it this weekend. The more I think about this game, the more I really appreciate the writing. Whatever Yoko Taro did or didn't intend, it's a lot to chew on either way, even if it's more successful at times than others. But how it deals with humanity in a game with, ostensibly, no humans, is fascinating. Particularly the robot characters. Probably the most interestingly written game I've played in awhile. And I'll say for like the 3rd time or whatever that the soundtrack is killer. Beat it a second time. Still think the final boss fight is the weakest in the game full of mostly fun fights. It's a bit of a slog. I did like how the final third or so was quite different as 9S, lots of schmup action and hacking. Route C has been totally bonkers so far. :) Something that happens right at the start pissed me off so much! But it was a good move story wise. Ok, I am now at the very end of route C. This game is so sad! The thing that happens to the robot children in the village, and the whole story of the twins Devola and Popola is super sad too. And all the stuff that 9S and A2 are going thru. I'm really loving my time with this game. I've only got about 10 trophies left to collect. And I currently have all of the weapons except for 1, I know where it is, but you have to beat a level 99 boss to get it, and I'm only at level 71 so I'm not ready for that fight yet. I've also collected about 19 of the 26 endings. Now to use chapter select to get the remaining endings I'm missing. OH and the story is still crazy! This is totally shaping up to be my favorite game for this year. I still think this is my favorite game for 2017. ~65 hours it took to do everything, not completely sure since I can't even go and check that now. What happened to your save games? Can't you recover them from the cloud? at the end of route E.
I'm not sure about recovering from the cloud b/c it auto saves after that. That's quite the gimmick. I'm thinking I might have to play this sooner rather than later.